You can find this information out easily on the website and you do not have to be logged in to do it. There are 3 drop down menus: Region, Yacht Club, and Member Type. You select one, two, or all three to narrow the display of current members. NOTE – after you make your selections you must click on “Search”. [Do not enter anything in the "Search For" space unless you want to specify a particular member to look for. If you do, a partial name is okay as well. Entering "Sch”"will result in a list of members whose last name begins with "Sch".] The resulting list of members will be displayed under Search Results. Selecting Region="ECESA" will give all current members from the Eastern region. Selecting Region="All Types" and selecting Member Type="owner", will give a list of all current boat owner memberships (those people who have a current boat sticker on their hull). 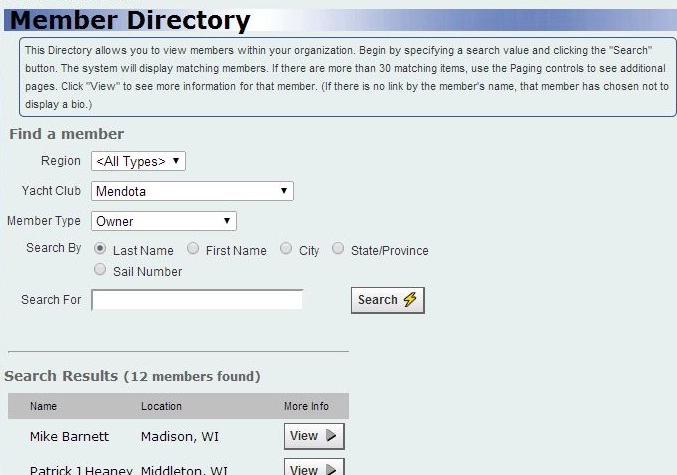 Selecting Yacht Club="Mendota" would display all current members from the Mendota YC. However, you cannot tell what type of member each person is unless you also select Member Type and choose one of the drop down choices. Basically, selecting more drop-down menu choices narrows the search results. If members add their social networking information, that too is available. Members can also upload pictures, provide a biography, indicate their interests, and outline their achievements. NOTE: You have to be logged in to see member detail information.